While Senators Cardin and Portman are trying to sneak a last-minute amendment into the budget bill to make BDS illegal – violating free speech – 26 states are also moving to make boycotts of Israel illegal. 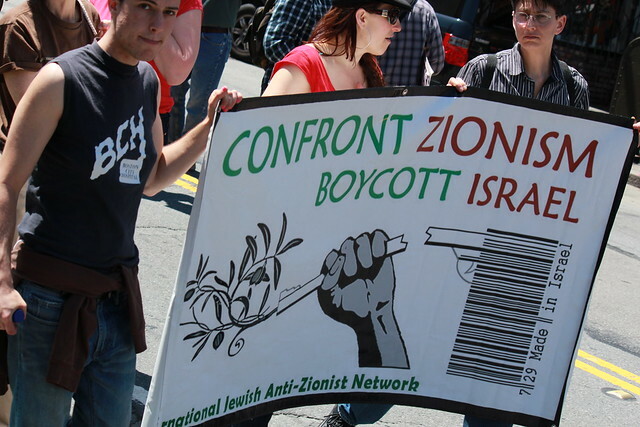 We speak to IPS’s Phyllis Bennis about the anti-BDS efforts in the US. A children’s speech pathologist who has worked for the last nine years with developmentally disabled, autistic and speech-impaired elementary school students in Austin, Texas, has been told she can no longer work with the public school district after she refused to sign an oath vowing that she “does not” and “will not” engage in a boycott of Israel or “otherwise tak[e] any action that is intended to inflict economic harm” on that foreign nation. A lawsuit on her behalf will be filed this morning in a federal court in the Western District of Texas alleging a violation of her First Amendment rights of free speech and free expression. This entry was posted in Congress, Human Rights, Imperialism, Israel, Israel-Palestine-Gaza-Occupation, Palestine, Politics and tagged Apartheid, Bahia Amawi, BDS, Chris Hedges, First Amendment, Free Speech, New-McCarthyism, Phyllis Bennis. Bookmark the permalink. I will boycott- at the polls – any candidate who supports the bill to prohibit BDS! Great idea, Sam. Also let them know the reason(s) why you don’t support their candidacy. Utterly shocking ~ but not surprising. ‘One belt, one road’ and now…..one ‘perfect’ law ~ do what you’re told, or else! This is absolutely incredible. People are losing their jobs over this. It’s so against the First Amendment I can’t see it actually becoming law at the Federal level and don’t know how it has become law at the state level in so many states already. It shows just how desperate the Israeli govt. is to resist BDS, that means, (as the video suggests) it must be really effective and threatening to them. It also reveals the abject conformity of the conditioned US response, really deeply concerning ~ that such blatant manipulation can render their Constitution ostensibly impotent….bamboozling State administrations into abject deference to right-wing Israeli propaganda, that undermines established and accepted constitutional norms & allowing them to be bypassed and trivialized. Just extraordinary. Yes, exactly, David, so very well stated.